Vision: Transforming Lives In The Community From The Inside Out. The way that we accomplish that will be through our Mission: Becoming Fit To Serve Others In The Community.We as Americans are blessed with the freedom that we have, to do as we choose. This can be our biggest crutch, because with our freedom we choose to serve ourselves, and this becomes a cancer which sufecates our ability to love one another. Most globo gyms will work on the outer appearance of the athlete…but at Crossfit 2 Serve we will look at the inner strength as well as the outer strength. We will use the God given gifts that we have been given as athletes to serve our community and others who need our support. Now having a purpose this will produce greatness in ways that you would of never imagine. This will start the transformation of your mind, body, and soul! 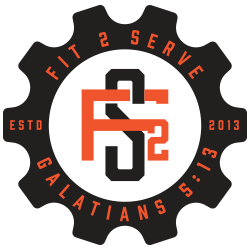 At Crossfit 2 Serve we are a firm believer that Without a Goal , Discipline is Self Punishment. So when you are working for something that is unseen (a Goal). Your daiy actions towards that goal may be self punishment for someone else who does not have a goal….but for you it is like brushing your teeth. you know that you have to do it daily. Galatians 5:13 You have been called to liberty; only do not use liberty as an opportunity for the flesh, but through love serve one another.